If you?re looking for a keyboard that saves space, try Verbatim's 96983 Wireless Slim Keyboard Designed with a piano black finish, this keyboard features low profile keys that provide a crisp, responsive feel when typing. This ultra-slim 96983 Wireless Slim Keyboard offers 2.4 Ghz wireless communication ? that means no annoying delays in what you type and what you see on-screen and no cord clutter. If you?re in to music, the media console lets you control your favorite tunes directly from the keyboard. 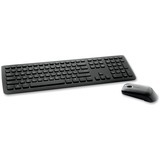 With its slim design and a wireless mouse, this Verbatim 96983 Wireless Slim Keyboard is a perfect space-saver. Ultra-Slim Design � Thin-profile keyboard and mouse designed to enhance your digital lifestyle.